Paranormal Pop Culture: Clive Barker to Pen 'Hellraiser' Remake? Clive Barker to Pen 'Hellraiser' Remake? HOT FROM HELL! My friends, I have some news which may be of interest to you. A few weeks ago I had a very productive meeting with Bob Weinstein of Dimension Pictures, in the course of which I pitched a remake of the first "Hellraiser" film. The idea of my coming back to the original film and telling the story with a fresh intensity-honoring the structure and the designs from the first incarnation but hopefully creating an even darker and richer film-was attractive to Dimension. Today I have officially been invited to write the script based upon that pitch. What can I tell you about it? Well, it will not be a film awash with CGI. I remain as passionate about the power of practical make-up effects as I was when I wrote and directed the first "Hellraiser." Of course the best make-up in the world loses force if not inhabited by a first-rate actor. I told the Dimension team that in my opinion there could never be a Pinhead without Doug Bradley, and much to my delight Bob Weinstein agreed. So once the papers are signed, I will open a Lemarchand Configuration, dip my quill in its contents and start writing. I promise that there will be nowhere on the Internet where the news of my progress will be more reliable than here, because the only author of these reports will be Your Infernal Corespondent, me. Barker states that "there could never be a Pinhead without Doug Bradley," and Hellraiser fans will most certainly agree. Remember when Stephan Smith Collins attempted the role in "Hellraiser: Revelations?" Yeah, neither do we. However, while Barker, Dimension Pictures exec Bob Weinstein and every fan everywhere all agree, Doug Bradley took to his own Facebook to dispel any rumors. 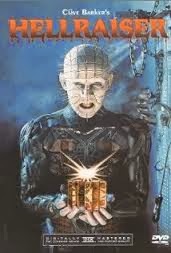 Just arrived in Orlando for Spooky Empire, to be greeted by the news via FearNet and Clive Barker's Facebook that he is writing a new "Hellraiser" script and intends that I should play Pinhead again. This is intriguing news, about which I know absolutely nothing. No one has contacted or spoken to me about returning. So until you hear from me to the contrary, assume that all rumors about me returning as Pinhead are only rumors. While all this news is as fresh as a razor through flesh, it looks like we will have to wait just a little bit longer for this nightmarish reunion to become official.